MOSCOW, May 31. /TASS/. Saudi Arabia and Russian companies are discussing a number of joint oil and gas projects, Russia’s Energy Minister said Wednesday. "Yes, those issues have been discussed by our oil companies, Saudi Aramco, Saudi Arabia’s minister who is currently in contact with heads of Russian companies," Novak said when asked whether Saudi Mister of Energy, Industry and Mineral Resources Khalid Al-Falih had touched upon the participation of Saudi Arabia in Russia’s oil and gas projects. Russia’s Energy Ministry reported on May 30 that the sides had held talks focusing on cooperation in the area of technological cooperation. 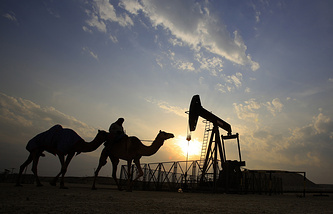 Novak noted an increasing interest of Russian oilfield services companies to the market of Saudi Arabia. The minister also mentioned the creation of joint R&D centers on the development and introduction of technologies in such areas as oil and gas production, oilfield services and transportation of crude hydrocarbons among promising projects.